A tree grows in Brooklyn. Planted in Prospect Park in 1872, the Camperdown Elm is a singular specimen, with gnarled, hulking branches extending nearly parallel to the ground. 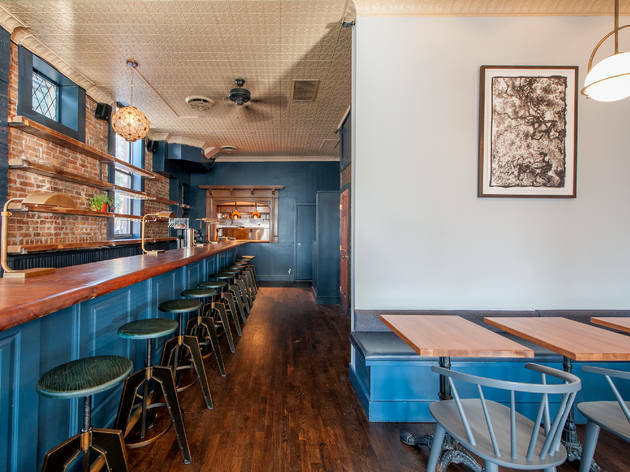 A short stroll westward and down the gentle slant of Park Slope lies a restaurant with the same name—not nearly as old, but no less of a neighborhood gem. 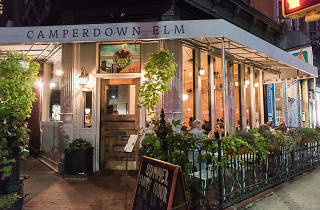 Camperdown Elm is the rare kind of place where beautiful, technique-driven dishes are presented as food you’ll want to devour, rather than art you’re meant to behold. 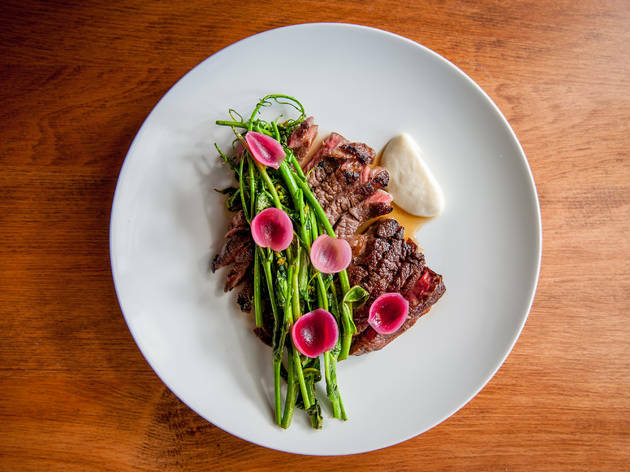 Chef Brad Willits honed his fine-dining chops at Manhattan’s Agern and Aldea, and is using them to great effect in the cozier confines of farm-to-table Brooklyn. 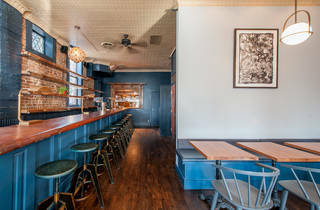 While the space sports classic BK-rustic attire (butcher-block tabletops, exposed brick and a pine bar salvaged from an old bakery), Willits’s food has a style all its own. Look no further than crisp golden pillows of deep-fried muffin batter ($4) slathered in tangy French butter whipped with apple vinegar and skyr; or wafer-thin rice crackers ($7) made jet black with squid ink and topped with silky mackerel rillettes, an ode to the classic Floridian smoked-fish pâté that Willits’s dad served in his restaurant. 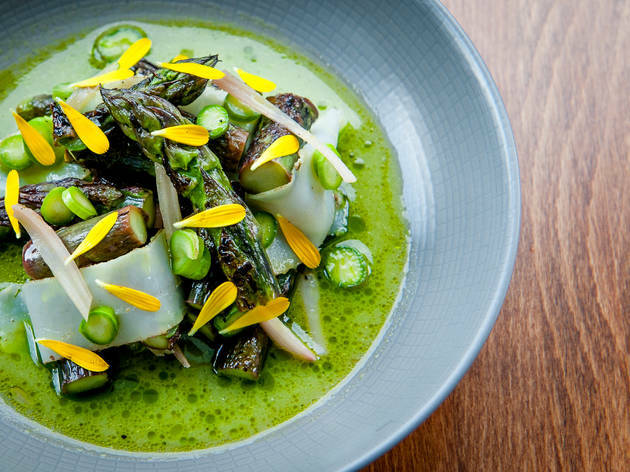 Faithful to the ever-evolving canon of New American cuisine, the menu pulls ingredients from a decidedly global pantry. Yellow miso and lime enliven a luscious avocado purée pooled beneath thick, firm slips of citrus-cured bass ($16). 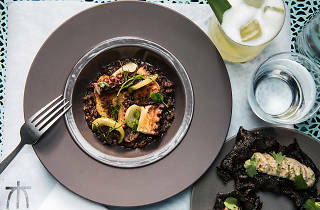 Dashi stock (steeped with roasted sepia tentacles), smoked butter and crème fraîche conspire as a heady froth for thin, tender slices of plancha-charred cuttlefish ($13). 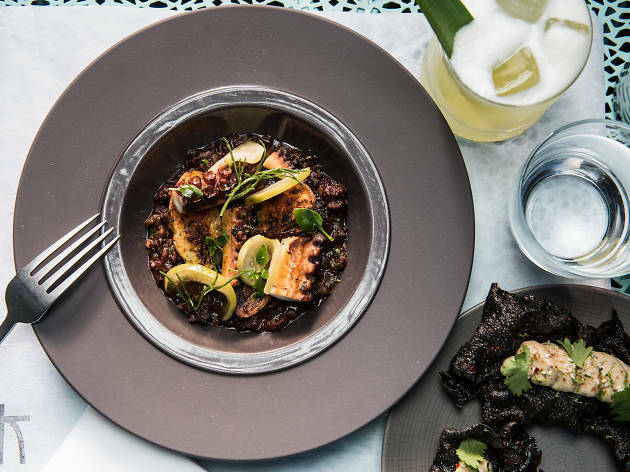 Then there’s octopus (oil-poached, seared and grilled over Japanese charcoal), atop a ragù of blood sausage (house-made with pork belly and snout) fortified with octopus stock, chicken jus and six-hour soffrito ($15). Go ahead and drag your finger through the dregs; though technically sophisticated, it’s still straight-up comfort food. Willits eagerly uses every inch of his ingredients to make them taste like heightened versions of themselves. Take the lamb ($23): spice-cured saddle, cooked sous vide then basted with jus from its own roasted bones as it sears. Attending the blushing slices of fat-capped loin and belly are humble carrots that are confited in lamb-fat brown butter, charcoal-grilled and glazed with their own juice. 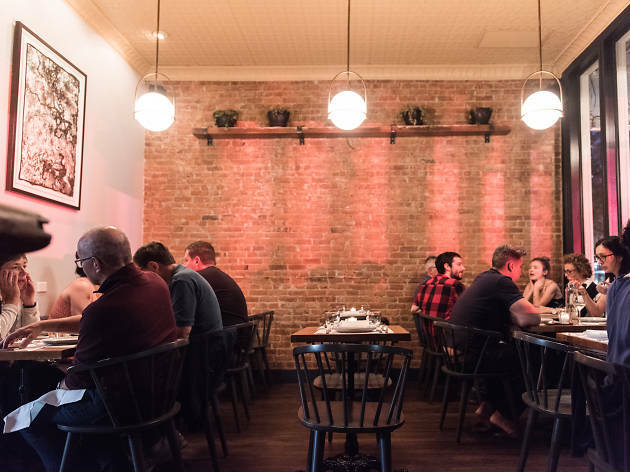 Willits’s flavors reverberate off one another, at once satiating and complex. 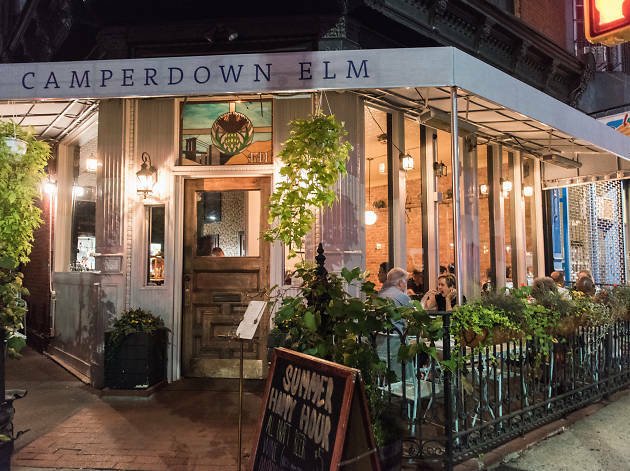 Boasting dishes as beautiful as they are unique, Camperdown Elm does its namesake proud. Here’s hoping it stays rooted in Brooklyn for a long time, too.